Dentures can help restore chewing function and can enhance your smile. 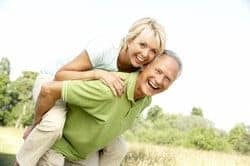 Alpha Dental Center offers both traditional removable dentures, and dental implant dentures; Dr. Munal Salem, DDS, or one of his associates can help determine which option is best for you. Traditional, removable dentures can be either a full arch of the upper or lower jaw, or a partial to replace several missing teeth. The partial is attached to the natural teeth on each end of a gap and the full denture is held in place be a dental adhesive. Implant supported dentures are attached to metal posts surgically implanted in the jaw. These posts can support either a partial denture or a full arch of upper or lower teeth. Traditional Dentures provide a natural appearing smile and a good basis for chewing and good oral health. A partial denture will fill in gaps left by missing teeth and prevent existing teeth from moving in to fill that space. Implant posts fuse to the jawbone and that gives them the strength to permanently support the porcelain dentures. The posts also help maintain the natural strength and shape of the jaw by restoring healthy stimulation to the jawbone.